Creating folders is by the far the easiest way to keep all your emails without letting them cause too much clutter. It's really easy to create Yahoo email folders no matter where you access your email—your phone, computer, tablet, etc. 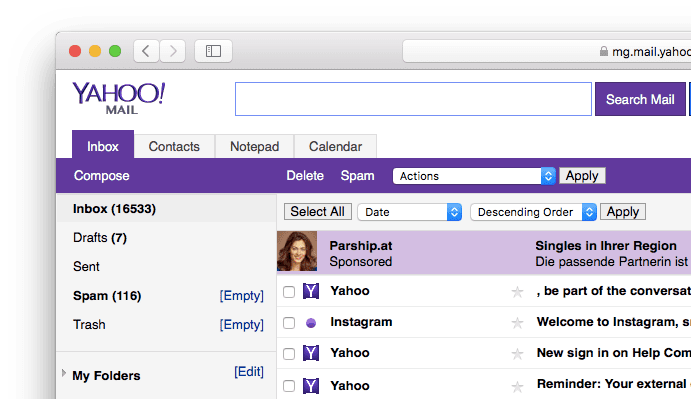 When you make a folder in Yahoo Mail, you can put any or all of your emails in there and access them in much the same way you always have. Maybe you want to make separate folders for different senders or companies, or use an email folder for storing emails of a similar topic. Instead of manually moving emails into a custom folder, consider setting up filters to automatically move them into respective folders. Yahoo Mail lets you make up to 200 custom folders, and it's really easy to do in the mobile app as well as the desktop and mobile versions of the website. On the left side of the Yahoo email page, below all the default folders, find the one labeled Folders. Click the New Folder link just below it to open a new text box where it asks you to name the folder. Type a name for the folder and then hit the Enter key to save it. You can delete the folder using the small menu next to it, but only if the folder is empty. Yahoo Mail Classic works a bit differently. Locate the My Folders section on the left side of your Yahoo email. Below Add Folder, type the name of the folder into the text area. Tap the menu at the top left of the app. Scroll to the very bottom of that menu, to the FOLDER area where custom folders are located. Tap Create a new folder. Name the folder in that new prompt. Tap Save to create the Yahoo email folder. Tap-and-hold on a custom folder to make subfolders, rename the folder, or delete the folder. Tap the hamburger menu (the three horizontally stacked lines). Tap Add Folder next to the My Folders section. Tap the Inbox link to go back to your mail. To delete one of these folders from the mobile website, just go into the folder and choose Delete at the bottom. If you don't see that button, move the emails elsewhere or delete them, and then refresh the page.